Yacht StarShip offers Florida’s Largest Fleet of Dining Yachts, with top quality service, breathtaking views, entertainment, and award-winning cuisine! We are America’s First 3-Diamond Rated Dining Yacht, ranking our yachts in the top 28% of all restaurants. With 4 yachts we are the perfect venue for any corporate event from 2-600 guests. Dockside events can accommodate up to 1,200 guests. Yacht StarShip I is the only dining yacht in Tampa Bay with an elevator servicing all 3 passenger decks. With our premium brand of service, Yacht StarShip is the only dining yacht of its kind in the South. Whether you’re hosting a board meeting, luncheon or conference, we have the perfect package for you. As Tampa’s #1 Holiday Party Venue, dates go fast so reserve now and let us “wow” your guests with award winning service and cuisine! Great teamwork is one of the key factors associated with a company’s success. 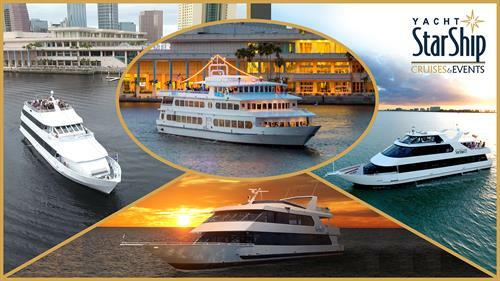 Invite your team for a day of team-building with a beautiful sunset cruise of Tampa Bay! Enhance social relations with collaborative team-building tasks! Enjoy games and training exercises outside of the office that are fun and beneficial for all involved.